A dull day today until late afternoon then it was spectacularly good. First job was for Jan to sort a ferry trip to Hoy and a minibus to take 8 of us to the start of our walk tomorrow. 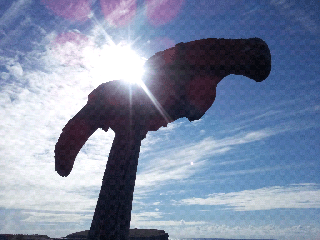 Once sorted we visited the 2000 year old village of the Broch of Gurness. Very impressive ruins considering their age. Shame it was raining. The highlight of the day followed lunch; a private tour of the Orkney Brewery. Red MacGregor, Golden Amber and Wayfarer were sampled. All on good form, as one would expect. We came out to a greatly improved scene, sunshine and spectacular clouds. The last stop of the day was near the Brough of Birsey. 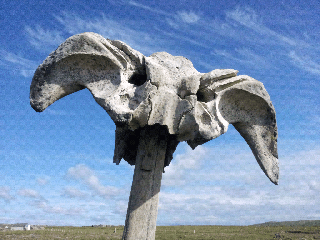 A whale skull mounted on a stake. Bright sunshine and streaky clouds behind the skull with an orange filter gave a very dramatic shot. I kept the land out of the shot so it was just a skyscape. It worked from both sides; sunlit and into the sun as a silhouette. I needed to be a contortionist though as camera had to be close to the ground. Fish and chips and Orkney Dark Island while watching England play Ukraine in Euros; torture. Rooney just scored, things are looking up!